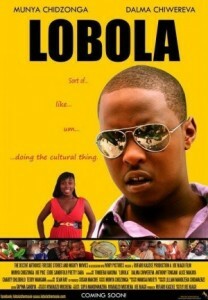 “Lobola” tells the story of a cosmopolitan young man, Sean Muza (played by Munya Chidzonga) who plots to come back home to Zimbabwe from America. Things take a new twist when he accidentally stumbles on information his father was keeping secret, leading Sean to make a rushed decision to prove his father wrong. He finds himself on a quest to plan and go through the process of paying Dowry (Lobola) in a single day, for Christine (played by Dalma Chiwereva) whom he has known for one month. Roping in his two equally ignorant brothers (played by Sean Silubonde and Tonderai Hakuna) and a drunkard Uncle (played by Antony Tongani) they embark on the mission. Their lack of knowledge and understanding of African traditions and norms sets them on a collision course with reality. Comically brought together this hilarious movie is set in contemporary Zimbabwe and it showcases the gap between the old and the young generation. Kabwato, Chris. “Arts Under Pressure.” Agents of Change—The Role of Artists and Cultural Actors in Regions of Conflict and Crisis. Ed. Vorwort. Germany: IFA-Edition, 2011. 81- 90. Print.